My heart goes out to the people suffering from this week’s tornadoes. I grew up in tornado country and have vivid memories of tornado drills. Watching the Weather Channel terrifies me. I used to have this recurring dream when I was a kid. I’d be at my grandmother’s house, just down the road from the farm where I grew up. In her living room hulked a big rounded armchair that was heavy enough to be a weapon. I would hear the sound of the train blasting down the tracks that ran alongside her property. Coming closer. Closer. I would look out the window. Instead of the train, I would see a giant tornado racing toward me, sweeping up tractors and horses and trees, huge and hungry and unavoidable. The only thing more terrifying than a tornado was the Michigan basement at my grandmother’s house. That’s where my dad and his sisters had lived as children one winter, after their house burned down in the middle of the night and before a new house was completed above them. My grandmother had barely survived starvation during the Depression, so she saved everything: bags of pinecones, broken dolls, bits of machinery, plastic bags. The basement was a maze of precarious junk. So rather than run to the basement to shelter from the tornado, I would crouch behind the old armchair. They’d taught us, during drills at school, to curl up as small as possible and shield our necks with our hands to prevent our throats from being slashed by flying glass. The tornado would come nearer. It spun right outside the house. The windows exploded. The heavy armchair was torn away. Nearly paralyzed with fear, I woke up before I could look into the storm. No doubt Freud would have much to say about the dream, but that doesn’t interest me. What interests me is that the dream was always in black-and-white. All of my other dreams were and continue to be in color. Only the tornado dream played in chiaroscuro. I was an adult, watching The Wizard of Oz for the zillionth time, when I finally made the connection. 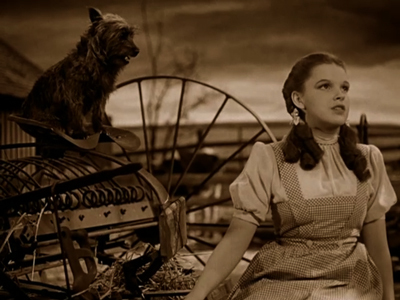 Dorothy was so brave in the face of that implacable funnel cloud. I never had the sense that my tornado was going to whisk me off to a technicolor adventure. Now, as an adult, I’d like to go back to that dream and see if I could ride the wind to Oz. Of course, it’s been a long time since I had a tornado dream. Once I figured what inspired its imagery, it came to me less often. I sort of miss the dream, if not the reality of tornadoes themselves. Now that my grandmother is gone, I would love to dream of being in her house again. This entry was posted in Morbid adventure and tagged memoir, nightmares, tornado, wizard of oz. Bookmark the permalink.